"<Beep>, dat klinkt lekker!" We muttered those words simultaneously as the first tones escaping the Mark & Daniel Maximus Ruby MkII hit the room. That <beep> was the most common Dutch swear word, a derogatory term for a female's privates. The rest translates as "that sounds good!". Not long before this moment of expressed stereo exaltation—really, we said it simultaneously--we received two small quite heavy boxes from China. Surrounded by serious protection almost like a car's crumple zone with additional foam padding, we lifted out a pair of small loudspeakers, one from each box. The included no-slip gloves made the job easier. Each measures 29.5 x17.5 x21.5cm HxWxD and puts a stout 9.2kg to the scale. This is due to the artificial stone called CAM for compound artificial marble, Mark & Daniel's signature material for all their cabinets. According to the documentation, CAM is reinforced for extra strength. Why that extra strength is needed we'd learn soon enough. The hand-made box has strong beveled edges on all sides, with the front sporting the strongest to suggest a vintage single cut-like diamond shape. At the tweeter location the cutaway is strongest and gradually the bevel rake recedes to flat at the mid/woofer's centre. From here a slight bevel increases again toward the bottom. Clearly, the Maximus-Ruby MkII is a compact two-way and our review sample came dressed in black for the occasion. For wideband duties, there is the firm's latest DM-6b air-motion transformer aka AMT. Its attention-grabbing glossy stainless plate contrasted strongly with the black cabinet but as a matter of taste, a black AMT version is available as well. 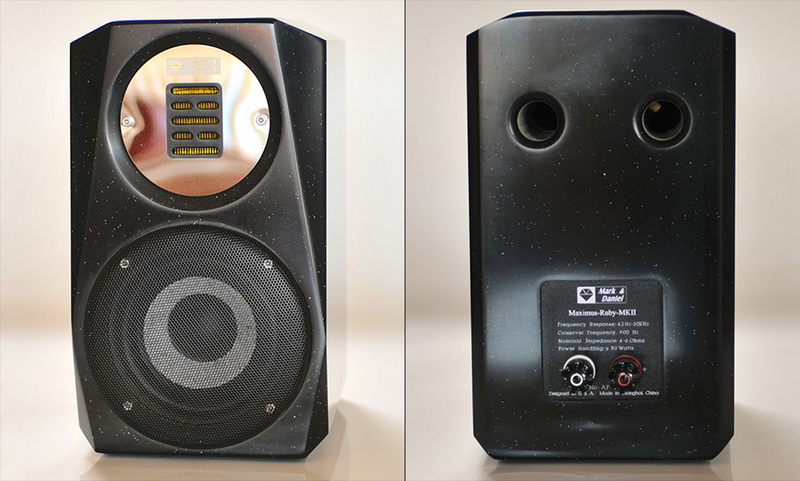 Below the AMT, their "super" woofer SX5.5a-0.8 tucks behind a magnet-mounted metal perf grill. At the back two small 3cm diameter ports at tweeter height caught our eye like twin exhausts. Through them a part of the tweeter's back was visible plus some foam damping material. Above the WBT 0703 speaker terminals the manufacturer lists some specifications: frequency response 42Hz-30KHz, xover 900Hz, nominal impedance 4-6Ω and power handling ≥ 80W. These specs for such a little loudspeaker intrigued us in three ways right off. Forty-two cycles from less than an 11 litre enclosure? The ‘tweeter' picking up from as low as 900Hz? Power requirements at least 80wpc? Was this an ESL in disguise?.